Everytime I say New York in my head, my mind follows it up with New YORK! Then I start singing “Start spreading the news… I’m leavin’ today…” I really wish I was. New York was intoxicating. Frantic, welcoming, isolating and engaging all at once. We were staying in another Airbnb place in Hell’s Kitchen, so we could pretend we were New Yorkers if only for 8 days. We arrived at our apartment at around 8pm after a long flight from Vancouver and much later than expected because the traffic from the airport was horrendous. After we met our host and had a quick tour of the apartment, we dumped our bags and headed to a bar we both saw on the walk from the bus station. There was no discussion required, we were thirsty and starving, and Five Napkin Burger was going to be our introduction to the New York food scene. Food and travel are so connected for me, many memories I have from holidays are related to food and our first New York burgers did not disappoint. After dinner, we strolled up to Times Square. Holy. Moly. Both of us were awestruck by the crowds, the lights and the noise. It was fascinating people watching and I felt like I was at the zoo but I’m not sure if I was in the cage, or watching from outside. We stayed out for hours, not spending a cent. Finally, around midnight, we stumbled home so we could get some rest and do it all again tomorrow. Most mornings I would go downstairs to buy a bagel. I ate so many I’m surprised I didn’t turn into one! My first stop was Jolly Goat, who do great bagels but also proper coffee which is definitely hard to find in New York. In the interests of conducting a proper bagel tour of New York I soon realised the bagels from the numerous delis studded up and down West 44th were just as good (according to my untrained bagel palette). Visit Central Park. Obviously it’s on everybody’s list but seeing it in winter gave it another dimension for me. Without colour and foliage, my eye focused on the structure and form of the trees, gardens and buildings. Experience Zabar’s deli. We had an awesome Rueben sandwich, bought from the deli inside the store which we enjoyed on a bench in the sun. Eat fried chicken at Sylvia’s and listen to live music in Harlem. Stu met a guy on a patriotic bicycle called Priestly. Harlem was great fun. Visit the New York Public library. There were a couple of free exhibitions on too which we enjoyed, it’s a beautiful space. Eat at Junior’s in Central Station. Not the best meal we had, but the cheesecake from their store near Times Square was good enough to make us want to return. Three times. 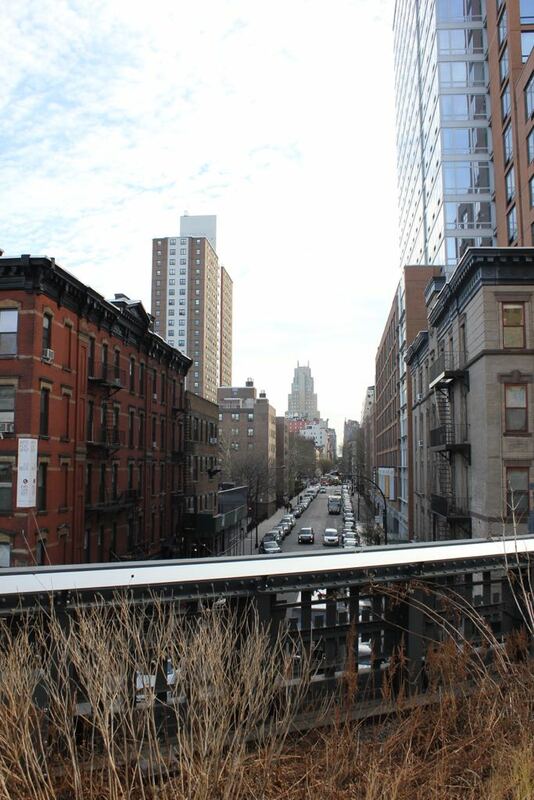 Walk the High Line. Our spontaneously fun friends Helen and Matt joined us in New York and we strolled the High Line with them. It’s a great concept, and it was wonderful to be slightly removed from the busy streets of New York. Join a tour of Wall St. This was a fascinating look into the underworld of the international money market. Visit Ground Zero. It was quite eerie to be there, but the ambience was soured by hundreds tourists and the scourge of selfie sticks. Why someone needs a selfie of themselves at Ground Zero is beyond me. Do Karaoke. I have no idea where we went. All I know is that we went out for Mexican and margaritas, then arrived at a Karaoke bar at a reasonable hour and left many hours later. Find Beauty and Essex and share a special meal. If you manage to find it too, you will also feel that you too deserve a celebratory drink and pat on the back. Pro tip: it’s not just an antique store. Wander around Roosevelt island. The cable car ride gave a wonderful perspective of the city. Visit the Metropolitan Museum of Art. I was astounded at the line of people waiting to get in, but I wasn’t in a hurry so I joined the queue and waited. It was worth it. The museum is beautiful and I was able to enjoy the art in surprising solitude. I would have stayed all day, but I needed food and the lines at the two cafes were ridiculous so I left. Next time I will visit in summer so I can sit on the roof top terrace. Pretend we could ice skate. My wobbly ankles did me no favours. I was sure I could skate. I took a turn off the ice so I could film Stu doing a lap, he did pretty well except he almost collected someone as he was so focused on reaching the safety of the hand rail. Stu came off and it was my turn to do a lap so he could film me for posterity’s sake. Except, Stu spent the whole time filming a fat guy in a jacket a similar shade to mine. Explore the Guggenheim Museum. Modern and contemporary art is usually not my thing, but such beautifully curated art in such a special space made it easy to enjoy and hard to leave. Go to the Top of the Rock. Crazy crowds. Many selfie sticks. Awesome views. Seriously, buy your tickets in advance and online. The queues are ridiculous. Survive Katz’s deli. The line to get in was so long we needed a slice of pizza to tide us over. Get your elbows out otherwise you will never be served or get a table. I wish we had not bothered and stopped for a knish at Yonah Schimmels’ Knishery instead. Definitely on the list for when we return! Find a diner on New Year’s Eve to serve us pie and hot chocolate at about 2am. Have a drink at Sardi’s for Mum who has last there in about 1965. Eat a hot dog from a hot dog van. The image I had in my head was better than the reality!! Walk and walk and walk. We had such a fabulous time. Although we were exhausted when we got home every evening, the city made us feel energised in equal measure. We didn’t find time to see a show on Broadway, listen to live jazz music, eat or drink at so many other places that were recommended, see the Museum of Natural History… the list goes on. We will just have to go back so we can be a part of it. Soon.